Loewer's fine meshed hay nets - Welcome! permanently allowed to take food in small quantities. Our topic is the horse as "continous-vore"
In nature, horses cover a distance of many kilometers a day while searching for food or water. They take up food steadily. The complex digestive system is laid out to take up only small quantities of food. Horses have in relation to their body size a small stomach, but a very long intestinal passage. The stomach is producing stomach acid permanently - even if no food is available. With this knowledge it will quickly be realized what can happen when feeding too much at once, or have too long breaks between feeding times. The consequences are not rarely colics and stomach ulcers. But also the feeding of too much hay, straw and grass can cause illnesses. Especially our robust bleeds are very good food exploiters by nature. No wonder, since they originally lived in meager landscapes and had little to eat there. It was vital to exploit the few and poor in content food as good as possible. Sure, that these horses now become easier thick or ill. In nature horses are never bored. They spend a big part of day and night with searching food or eating. How should our horses keep busy? Many are staying 23 hours a day in the box - perhaps even on sawdust without straw to nibble. Twice, at best three times, the horse gets hay and crib food, which is eaten with ravenousness, and much too quickly. Also for many open stable horses the long winter without feedlot is boring and tedious. The consequences are e.g. wind sucking, weaving, head shaking, wood nibbeling or (at least in the eyes of man) just nonsense. Or they stand all day at the hayrack, eat too fast and too large quantities of hay and become thick and round. We know not every horse owner has the possibility to keep his horse in a totally appropriate environement. But often, even small changes in the daily routine of a horse lead to a more horse-like arrangement . In this process, we want to help you with our fine-meshed hay nets. Eating times extension of a healthy and horse-like food intake. We are pleased that in recent years a change for the benefit of our horses has taken place. 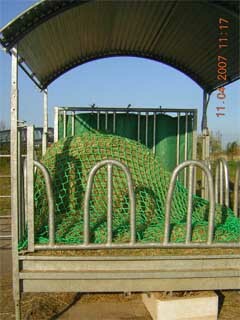 Several scientific studies show clearly that the feeding with fine-meshed hay nets is very beneficial. Not without reason, to our international customers belong many professionals, such as Vets, horse osteopaths and - physiotherapists, horse clinics and veterinary practitioners, veterinary faculties, hoof specialists of all educational backgrounds, animal protection organizations, breeders and horse pension businesses, feeding experts and manufacturers of horse food, professional riders and trainers, academies, riding shop specialists, saddle experts, and last but not least, a very large number of private horse owners! We would be delighted if we could convince you! Look to the information-site for more useful information about choosing the right hay net. Or you can call or mail us for individually advices. You and your horses are dear to our hearts!